When I was in the fifth grade, I wanted to be an astronaut. (Maybe we all do.) My teacher told me that that would never happen: I was not fit enough. Exercise was my eternal nemesis in the Boy Scouts. I think all of the first three rank levels have a fitness requirement? It's been a long while, I don't know where my The Boy Scout Handbook, tenth edition, is, and no one on-line seems to have duplicated this information. 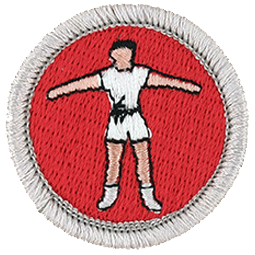 I do know that I started the Personal Fitness merit badge at least three times. Alas, Personal Fitness was required for Eagle, and thus one of the reasons I never attained the rank. I would always start the badge at summer camp, but it required some amount of work on your own, and then a re-evaluation after some period of time (thirty days? ), and I never had any follow-through. No discipline. I am by nature an undisciplined person, but can force myself to be disciplined when I need to (though I understood this about myself much less well when I was seventeen). Or perhaps "want to" would be more accurate, and I never wanted to. 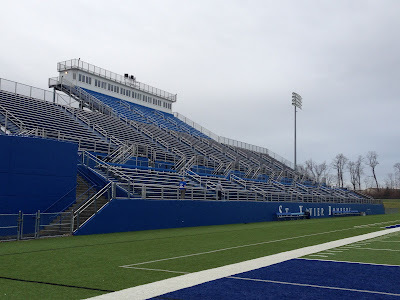 Stadium was not this nice in my day. Also I can't find a picture on-line with the track visible. When I was in high school, we had to take a year of gym. I was miserable; Coach Rasso once pulled me aside during a volleyball game and worked with me one-on-one for like fifteen minutes. It didn't help. When we did our running unit, the climax of it was a timed six-lap run around the track. (I assume this equaled a mile, but I don't really remember.) Coach pulled a number of boys aside and said they only had to do five laps. And then he looked at me and said, "Mollmann, you only have to do four." Well, so help me, I was elated. So elated, in fact, that I ran the fastest I had run that entire unit. With the consequence that when I finished my four laps, I was done so quickly, Coach didn't believe I'd really run four laps, and so made me run one more... which meant I was completely exhausted and finished in last, absolutely miserable. Oh well, I guess he tried to help. Still, I'll take what I can get. My grade school gym teacher told me I was so bad at exercise I'd be dead by the time I turned thirty. Two years later, I'm still alive, so I guess I'm doing okay. #528: How has exercise changed your health, your body or your life? Combine audio books with exercise. It's not as pleasant as curling up with a good book, but at least you get some reading in.